Stan's new multicultural children's book is now available on Amazon with illustrations by Ifat Naim of Bangladesh. 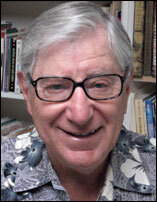 San Diego Union Tribune article featuring Stan and this book. This 1-hour book for busy people is loaded with fresh, new cutting-edge ideas to help alleviate the funding gap that exists in today’s K-12 schools. The more than 350 electronic links included will save you time, energy, and money and will keep you in touch with the latest innovations in fundraising for K-12. Whether you are a classroom teacher, a parent, a school foundation member, a school administrator, a volunteer, a school board member, or a school foundation board member, this book is written for you. Following the model used by colleges, universities, and private schools, Levenson presents a wealth of ideas to enable you to obtain individual classroom grants for K-12; corporate, foundation, and government grants; and grants and gifts from individual donors. He also provides assistance in working cooperatively with your board and shows you how to connect with million-dollar donors by representing a cause that touches their hearts and lives. It’s all here for you, and best of all, this book shouldn’t take you more than an hour to read. The book is receiving rave reviews and testimonials from some of the biggest fundraising names in America. Jerold Panas, best selling author says, “There is likely no one in the country who knows more about fundraising for public schools than Stan Levenson. There’s nothing else like it. 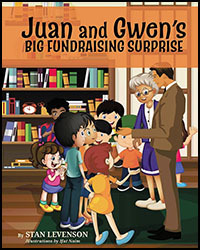 It takes you by the hand and leads you through every step in a school’s fundraising program. It is fail-proof in building a successful design that ensures you of raising a great deal of money." 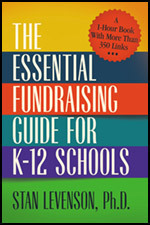 Charles Best, CEO of DonorsChoose.org says, “The Essential Fundraising Guide for K-12 Schools is a great resource for the first-time and veteran fundraiser alike. Whether you’re looking for donors to fund a classroom project or launching a capital campaign to build a new facility, Stan offers dozens of practical tips and know-how to make the most of your efforts.